Word got out this week that SeaWorld Orlando had been cited in January for two violations of the Animal Welfare Act, following an inspection by the U.S. Department of Agriculture (USDA) that found unrepaired flooring in an animal enclosure and expired sutures in the surgical room. But this is not the amusement park's first violation, according to records from the USDA. An inspection report filed by the USDA in 2007 found two violations at SeaWorld Orlando. The first was for objects that were dropped by the public into an enclosure where pinnipeds (fin-footed marine mammals like seals) were kept, on the area where they haul out of the pool. The second violation was for the floor in the Sea Lion and Otter stage -- the same issue noted in the most recent violation. The report says that the Sea Lion and Otter stadium stage area had deteriorated, and highlighted paint chips, exposed building materials and eroded wood. The materials "posed a risk of ingestion which can potentially harm the animals that perform in this stadium," it said. In December 2012, following a complaint by PETA over a child that was bit by a dolphin, the facility was again inspected by the USDA. The report found that there was no system in place to check for expiration dates on sutures used in veterinary surgery. "Many sutures were expired, some dating back to 2003," it reads. The report also found several structural issues with a few of the enclosures. It says that there were several cracks in the concrete around the dolphin pool, and warns that they "might create a health risk if these pieces of concrete fall into the pool and get ingested, or if they become abrasive to the dolphin's skin." 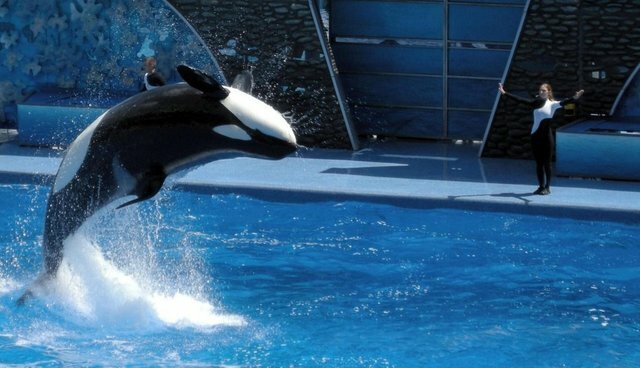 Similar issues with chipped and unrepaired flooring in the Shamu stadium were found that "can potentially cause a health risk to these whales." The most recent report found two violations during a mid-January inspection. Again, expired sutures were found in the surgical room, and the floor of the Sea Lion & Otter stadium was found to be unsafe. Jared Goodman, Director of Animal Law at PETA, says that there have likely been more violations found at the park, but the records are not available. "It's an ongoing problem," he said. He also added that the most recent issues were repeat violations, meaning that SeaWorld had been warned previously about them, and failed to remedy them. "...both items discussed during the inspection were corrected prior the USDA inspector leaving SeaWorld property. Before conducting surgical procedure SeaWorld veterinarians check the expiration date of all materials needed, including medicines, supplies and equipment. Out-of-date suture materials would not have been used during any procedures. SeaWorld may be adding another violation to the list -- PETA recently asked the USDA to investigate an incident during which another child was bit by a dolphin this week.